We produce our leather bags from the highest quality cowhide, we offer a full 4-year warranty and provide you with great prices because we cut out the middleman! There are many different bag shapes and sizes, so there is something for every taste. Under each product there is a description of the size of the bag. 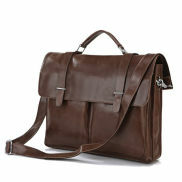 Trendhim leather bags for men. 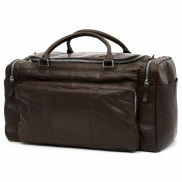 Men have always relied on bags to carry around the personal possessions they need to be using. Some of our designs are classic and have a Retro look and feel about them. leather backpacks, sports bags and more. Our leather bags are very different in appearance because of the way the leather is produced. You can get wide variations in surface smoothness as well as how much of the natural hide defects and grain pattern show through. 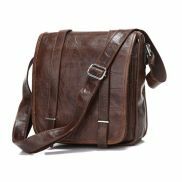 These qualities determine which kind of leather is used for business or for leisure bags. The way that leather is produced from cowhide requires tanning the hide, so that the way the leather is treated influences the way it should be maintained. This kind of leather is often smoother and more uniform in appearance, thus does not require as much maintenance care. This kind of leather offers a rougher, somewhat duller surface that shows off the natural grain defects. These bags really benefit from proper maintenance such as using special leather creams. Penetrating spray especially conceived for leather is a great idea before using your bag for the first time. You would be wise to forget about folk remedies using things around the house. Many of those cheaper solutions can stain or discolour the leather. Never use detergents or chemicals either. Leather briefcases donât enjoy sunlight the way we do and excessive heat from radiators or stoves can also damage the leather. Rougher surface leathers really benefit from a good application of leather fat and respond best to natural cleaning agents such as beeswax. We recommend Gold Quality brand leather fat. Dried out and desiccated leather can be freshened up with a coat of leather oil followed by a leather grease application to seal it in. Size guide for your new leather bag. We disclose the exact size of all our leather bags on each of their own product page. They are stated in height (X), depth (Y) and width (X) as illustrated in the diagram below. is critical in order to find the right dimensions required. We are most often asked if our customer's laptop will fit into a certain bag. As you measure your computer, it must not exceed the width of the bag and you should then lessen it by 2cm. For example: the bag's width (Z) is 34cm, you remove 2cm. Then your laptop will fit into your new leather bag if it is 32cm or less.